Bucks County Audubon Society hosts ‘Advocacy in the Watershed’ event - Times Publishing Newspapers, Inc. Surrounded by all things avian, several dozen members and neighbors of the Bucks County Audubon Society gathered together recently on a chilly winter evening to learn what they can do to support advocacy efforts for the Honey Hollow and Delaware River watersheds. “Advocacy in the Watershed” took place on February 26th at Bucks Audubon’s refurbished barn headquarters in New Hope, part of a year-long celebration of Bucks Audubon’s 50th Anniversary. Stacy Carr-Poole, Executive Director of Bucks Audubon, kicked off the evening by welcoming the participants. “Our mission is connecting people to the natural world, producing that love and awareness of nature,” she said. 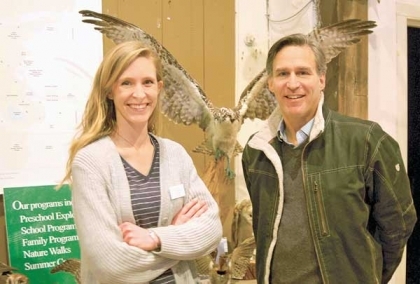 She added that Bucks Audubon is doing more all the time “to get people to take positive actions for the environment.” “Advocacy in the Watershed” is one such initiative. Also on hand to welcome guests was Greg Goldman, Executive Director of Audubon PA. “Audubon PA is always thrilled to work together with Bucks County Audubon Society to educate the public about issues facing our fragile Delaware River Watershed,” he commented. “We were so excited that nearly two dozen people came out on a cold winter night to learn how to effectively advocate to protect clean water in our region,” he added. The night’s featured speaker, Emily “Em” Ferrin, serves as a field organizer for Audubon PA, focusing on the Delaware River Watershed. Her lively presentation engaged attendees in discussions about ways that everyone can take part in advocating for conservation of our land, waterways, and wildlife. “If you don’t have a seat at the table, you’re on the menu,” she cautioned. Reminding the group about the historic land upon which they all sat, Em shared how the Honey Hollow Watershed, 650 acres just north of New Hope, was the first privately owned soil conservation district in the United States. In fact, this conservation district served as a prototype for thousands of watersheds across the nation, and because of its pioneering role, was later designated a National Historic Landmark District. Created in 1939 in order to mitigate the effects of erosion caused by modern agricultural techniques, the Honey Hollow Watershed conservation area was the brainchild of five local landowners. These five insightful farmers enlisted the support of the newly created federal Soil Conservation Service, which provided technical support to help create diversion ditches, contour-plowed fields, terracing, and hedge planting. The Honey Hollow Watershed sits within the larger Delaware River Watershed, which provides water for 5% of the US population. After sharing the historical significance of the Honey Hollow Watershed, Em asked those present to consider supporting three pieces of legislation: The Delaware River Basin Restoration Program, the next Magnuson-Stevens Act Reauthorization, and new legislation to protect forage fisheries. In particular, she encouraged everyone to call or write to Rep. Brian Fitzpatrick’s office asking for his support for the upcoming forage fish legislation. If passed, this legislation will help sustain the environment and economy by protecting critical fish species. Em also asked participants to support an upcoming proposal for increased appropriation of funds for the Delaware River Basin Restoration Program, a program promoting the protection and conservation of the Delaware River Watershed. E-mail bcas@bcas.org to be added to the advocacy action email list and stay tuned for more celebratory, educational, and hands-on events at the Bucks County Audubon Society’s Education Center and 55-acre preserve. Learn more at www.bcas.org.